A Blairgowrie teenager has high hopes for his future following a pioneering collaboration between his school and a local business. 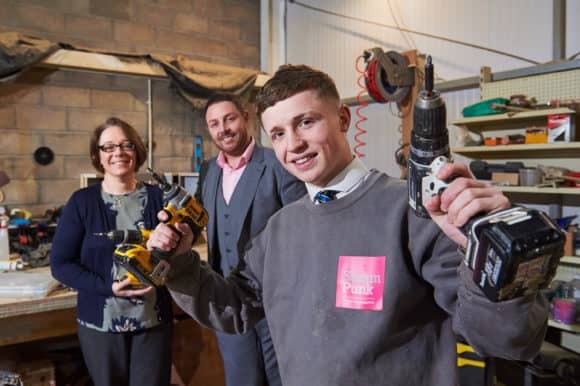 Eden Gordon (15), a fourth year pupil at Blairgowrie High School, is enjoying a highly innovative year-long work placement with SteamPunk Fit Out, a joinery and interior fit out contractor offering premier fit out services across both public and private commercial sectors. Their clients include a host of bars, restaurants, shops and offices the length and breadth of the UK. Eden Gordon is pictured with Darren Wilson, Managing Director of SteamPunk Fit Out and Melissa Lawrence, Project Officer, Developing Young Workforce at Blairgowrie High School. The placement, which sees Eden spend half a day at the company each week, is organised as part of the Business Partnership programme led by Developing Young Workforce (DYW) scheme. Eden has been learning and developing basic bench hand joinery, sanding and assembly skills, typically associated with entry level Apprentice placements. Part of the Scottish Government’s Youth Employment Strategy, Blairgowrie High School’s year-long Wider Achievement in Vocational Education programme (WAVE) is thought to be the only one in Scotland compared to the more common offering of week-long work placements. Businesses accommodating pupils on the year-long scheme receive a ‘Gold’ Business Partnership award the pupils themselves gain a series of employability modules, culminating in a SQA Employability Award at National 4 level. Darren Wilson, Managing Director of SteamPunk Fit Out hopes to take Eden on as an Apprentice at the end of S4 if he achieves good exam results in 2019. Darren said, “Eden’s future is in his hands but it’s certainly our hope to offer him an Apprenticeship which will see him gain an amazing skillset. At SteamPunk, we’re not just about standard joinery – we’re a versatile and multi-skilled team and Eden has the right attitude and ability to be part of that. If we take him on, he’ll learn traditional bench hand joinery and cabinetry from our Blairgowrie base as well as travelling nationwide working on-site on an array of shopfitting projects, using modern methodology and some rare and wacky sourced materials! As well as Eden, over 80 of his peers are currently enjoying work placements throughout Perthshire and Dundee, with pupils placed in a range of workplaces from primary schools, vets’ practices, accountancy and law firms to care homes, restaurants and hairdressing salons. The school is always looking to develop new business relationships for both the year-long work placement programme and also for shorter term bespoke placements. For more information, contact Melissa Lawrence, Project Officer – Developing Young Workforce on telephone 01250 871200 or email mlawrence@pkc.gov.uk. For more information about SteamPunk Fit Out, please visit http://steampunkfitout.co.uk.